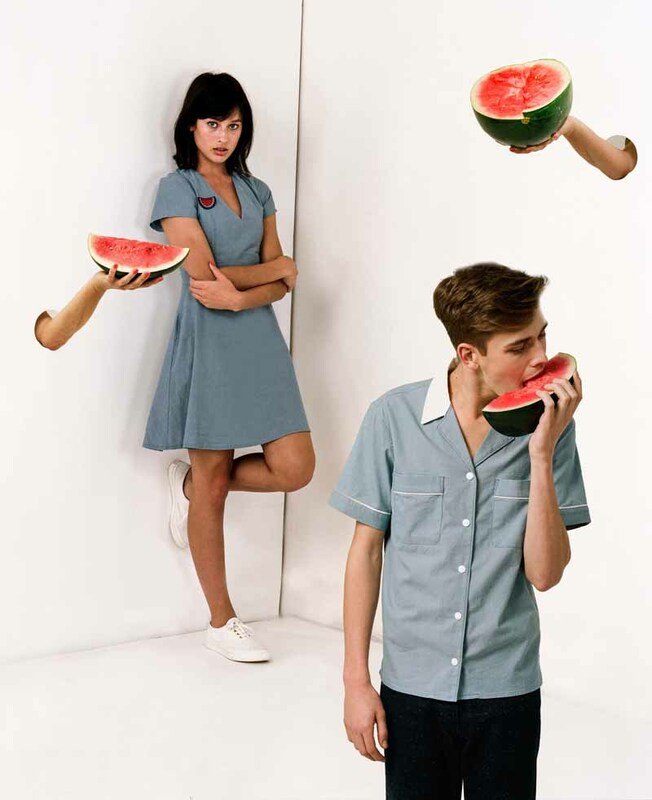 Launched this spring, the Maison Kitsuné “Spring Shake” capsule collection is airy and playful that makes one think of spring flings and summer dreaming. Designed by co-founders and creative directors Gildas Loaëc and Masaya Kuroki, this refreshing collection draws inspiration from the same carefree attitude and “joie de vivre” that once influenced the 1960s, an era defined by its independent thinking and revolutions, which erupted across America. The collection features chambray in cheerful shades of red, blue, cream and pink, evoking national pride in America and where the brand was first established, France. Swinging dresses and skirts are fitted at the waist, and men’s shirts are expertly tailored with contrasting colorblocks lending a classic touch. Captured by Dexter Navy, a young British photographer and filmmaker, the Maison Kitsuné “Spring Shake” collection is currently available in Maison Kitsuné boutiques and on kitsune.fr.